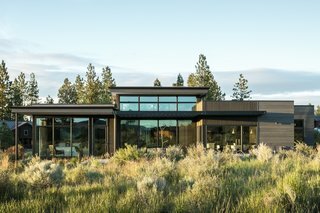 Set amidst the scenic scrubland of Oregon’s high desert, this elegant home has interior sliding panels that can be manipulated to conceal or reveal spaces. 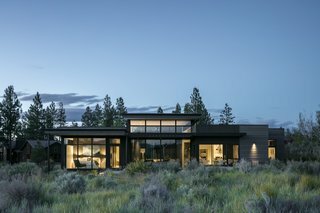 With an abundance of outdoor activities and a laid-back culture that celebrates great food, the small city of Bend and its high desert landscape charmed Nancy Burfiend and her partner, Joey Reiter, into buying a plot there for their next home. 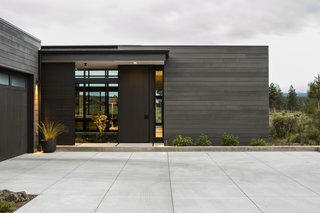 Nancy, who owns the Seattle–based interior design firm NB Design Group, tapped DeForest Architects for the project, having had worked extensively with the Seattle studio over the past 15 years. 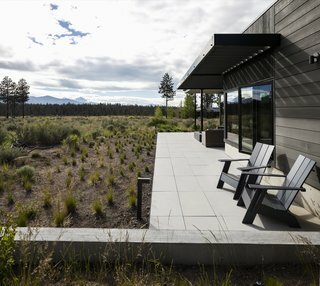 The lot offers sweeping views of the Cascades and the Deschutes River National Park. 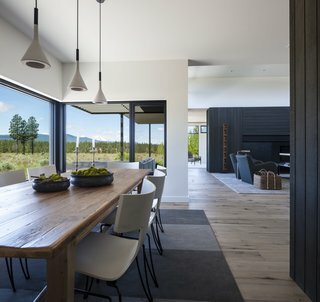 The couple’s vision was for a contemporary retreat where they could recharge in nature. 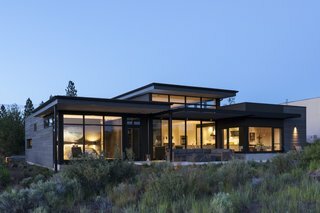 From the earthy, desert-inspired palette to the large expanses of glazing that create a seamless connection with the outdoors, it was their desire for an indoor-out living experience that drove the 2,670-square-foot design. Stained a warm charcoal gray, the cedar siding clads the exterior, while full-height glazing embraces views of the outdoors. "The house is organized as a series of light-filled spaces—entry, courtyard, living, terrace—that blur the boundaries between the domestic and the desert," the architects explain. Full-height glazing wraps around the south-facing side of the master bedroom. "Even in more personal spaces, hidden skylights and unexpected windows help capture the surrounding sky and landscape." "The owners have a love of blackbirds and had coveted this Indi wallpaper from Trove for years," add the architects. 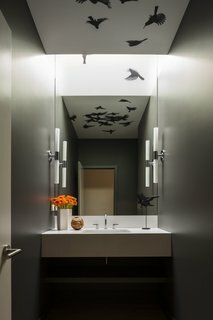 "The design team came up with the idea of applying it to the ceiling and wrapping it into the continuous skylight so the illusion of birds flying through could come to life. All who enter the room are surprised by the birds reflected in the mirror." To achieve this sense of expansiveness while preserving privacy, the firm added operable panels that give the homeowners greater control over the layout. Likened to a "Swiss Army Knife," the High Desert House features eight interior sliding panels and two hinged wall sections that can be manipulated to conceal or reveal spaces. "Sliding and swinging panels enable spaces to expand and contract as needed for the owners, a few guests, or large gathering," say the architects. 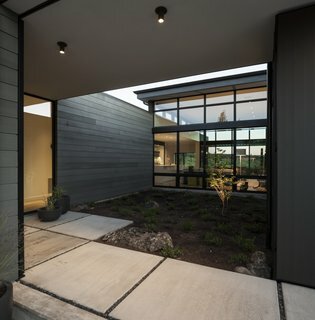 "At the entry courtyard, a rolling screen and swinging gate can be configured to be cozy and private, or wide open and welcoming." A look inside the entry courtyard flanked by the office to the west, the living area to the south, and the entrance to the east. The property features two bedrooms and two-and-a-half bathrooms. The cabinet wall between the master bedroom and living room is comprised of five sliding panels for concealing or revealing the space, while a hinged wall-section can convert a seating area into a guest room. Floor-to-ceiling sliding panels divide the master bedroom from the living room. The sliding wall cladded in cedar is integrated into the casework, and hides the television when not in use. The fireplace wall features custom-fabricated blackened steel with a sliding panel that can conceal the television when not in use. 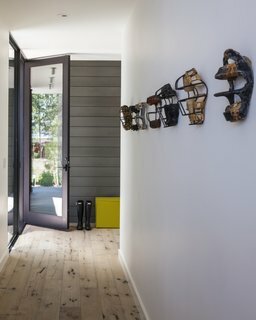 "The home’s clean lines and simple, light-filled volumes create a backdrop for evolving collections: a row of vintage catcher’s masks, softballs, and large industrial gear," add the architects. 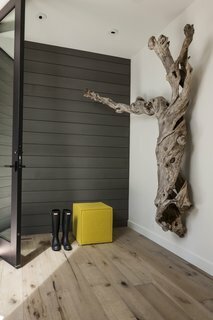 A sculptural lilac trunk—which is over a hundred years old—hangs on the entry wall and serves as inspiration for the interior color palette. The entrance hallway is lined with a series of vintage baseball catcher's masks, dating from the 1920s to 50s. Reclaimed white-oak engineered flooring is used throughout the home. When the sliding panels in the master bedroom are recessed, the opening allows natural light and views to flow unobstructed through the home. A vintage dining table built of reclaimed 18th-century English floorboards is combined with Donghia's Anziano chairs, which is a modern take on the ancient Greek Klismos chair. 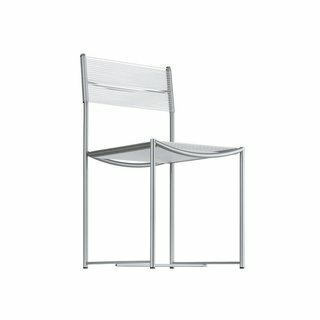 Spaghetti chair is material and formal simplicity that multiplies, in its many variants, opportunities for use. It is ideal for reception settings, trendy spots or for those who love a sober and informal style; practicality and discreet elegance characterize a coherent set of chairs. 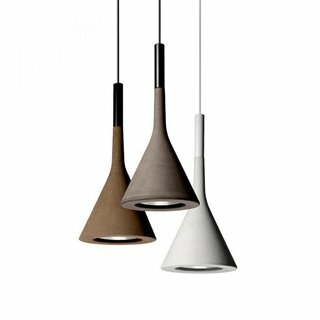 Aptly named, the Foscarini Aplomb Pendant ensures precise lighting, its concrete shade pulling the cable taut and lighting the room with a strong and handsome presence. 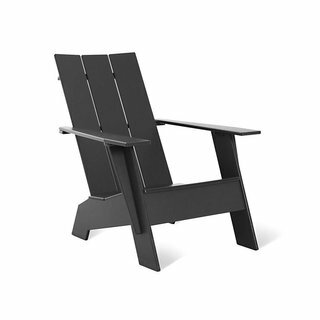 “We make outdoor furniture for the modern lollygagger,” explains Loll founder Greg Benson. “Our furniture is for people who are looking for fresh design that’s made in the U.S.A. with sustainable manufacturing practices. 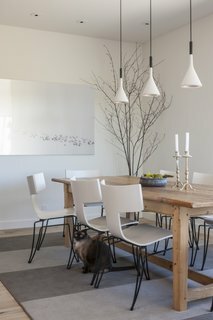 Aplomb Suspension Lamps hang above the dining table, which is set above a custom area rug by the client's interior design firm. Sally, one of the cats, is seen here. 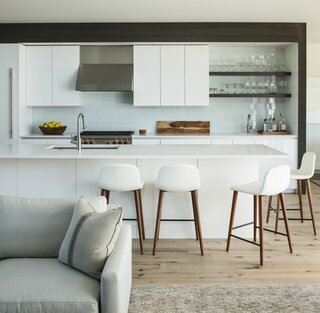 Designed to encourage communal cooking, the kitchen includes counter seating with Bacco Leather Counterstools (Design within Reach), as well as a built-in bar with a glassware display. Metalword porcelain tile covers the floor of the bathroom. 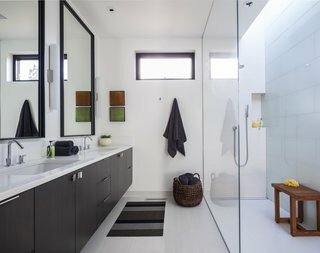 This space is made bright and airy thanks to the mostly white color scheme and skylight placed over the shower. A low horizontal window is perfectly positioned in the office to frame views of the Cascade mountain range. Aluminum-framed sliding doors connect the living room to an outdoor patio. A view of the home seen from the southwest. The double-height living area, tucked behind the outdoor patio, occupies the heart of the home. 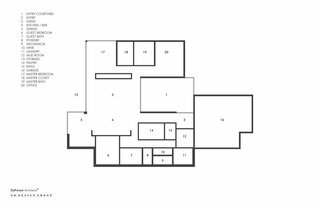 A look at the home's floor plan.